Dozens of civilians were reportedly killed by Islamic State militants in a central Syrian town before it was retaken by the Syrian army on Saturday. The UK-based Syrian Observatory for Human Rights says at least 116 died in the three weeks that Qaryatain, in Homs province, was under jihadist control. Most were shot or stabbed to death by IS for "collaborating", it added. The activist-run Palmyra Co-ordination Committee named 67 people it said had been killed by IS or government forces. There was no immediate confirmation from the Syrian government or state media. Qaryatain, about 100km (60 miles) west of the ancient city of Palmyra, was first occupied by IS in August 2015. Soon after taking control the jihadist group demolished the Christian monastery of Mar Elian and took prisoner about 200 residents, including dozens of Christians. About half were transferred to the IS stronghold of Raqqa, where the Christians were told initially they would be killed if they refused to convert to Islam. A priest who was among them told the BBC he was released 12 weeks later after IS leader Abu Bakr al-Baghdadi decreed that the Christians would be allowed to live in IS territory if they paid a special tax called "jizya". In April 2016, Syrian government forces retook Qaryatain with Russian air support. 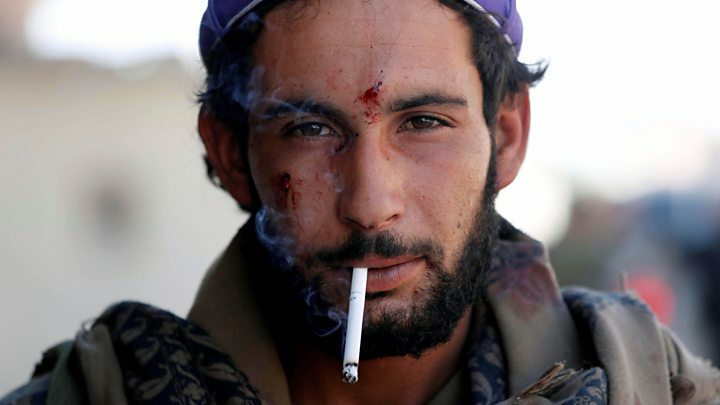 But at the start of this month, IS militants regained control of the town as part of a counter-attack in response to offensives by Syrian government forces and a US-backed alliance of Kurdish and Arab fighters in the eastern province of Deir al-Zour. On Saturday, state media reported that troops and allied fighters had regained control of Qaryatain "after eliminating terrorist [IS] groups that had infiltrated it". The Syrian Observatory, which relies on a network of sources inside Syria, reported on Monday that at least 116 civilians had been killed by during the IS takeover. Eighty-three were killed in the last two days before IS was driven out, it said, adding that militants targeted those they suspected of being "regime agents". "After the regime retook it [on Saturday], the town's residents found the bodies on the streets," the Syrian Observatory's director, Rami Abdul Rahman, told AFP news agency. "They had been shot dead or executed with knives. Most of the IS fighters who attacked the town a month ago were sleeper cells. They are from the town, know the town's residents and who is for or against the regime." 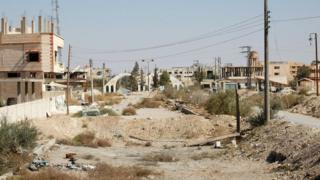 Twelve other people were killed by pro-government forces as they retook the town, according to the Syrian Observatory. The Palmyra Co-ordination Committee said on Sunday that more than 60 civilians had been killed in Qaraytain by "regime forces and IS" over the three-week period.